Retail Selling - Clerks or Salespeople? Do You Have Clerks or Salespeople Working for You? What is the difference between a clerk and a salesperson? Tons! For one thing, a clerk costs you money (payroll) but a professional retail salesperson makes you money. 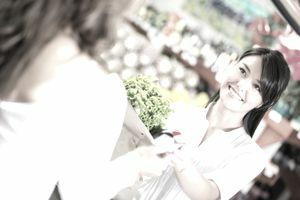 A clerk is focused on his or her interests and a salesperson is focused on the customer experience. A store full of clerks may survive, but it will not thrive and none of us got into retail to simply survive. 1. Focus. The clerk is focused on the paycheck. John Parker Stewart in his work Team of Champions, said that "with a paycheck you earn the hands and feet an employee, but it takes the heads and hearts to be successful." True, an employee's focus has a lot to do with his or her manager, but there are some intrinsic personality traits that help as well. Salespeople are focused on the customer. They want to know why a customer is buying something, not just what. If a customer comes in for a weed eater and a clerk sells them one, we might see this as a good thing. But a salesperson would have asked the right questions and found out the electrical outlet is 200 feet from the end of the yard and sold them a gas powered machine versus the corded electric. The difference is not only higher revenue from the product sale, but improved customer experience. How frustrated do you think the customer would be if they had an electric model? 2. Approach. A clerk asks "what are looking for?" and then shows you that. A salesperson asks "what are your trying to do?" and then interviews the customer to understand their motivation . In my book, The Retail Sales Bible, we discuss the importance of "Researching" a customer's wants, interests, needs, concerns and desires before you make a product selection. ​The net result of this approach is added sales, higher ticket averages and better margins in your store. The customer experience is dramatically improved and the result is a customer who tells others about your store and that is the best form of advertising. 3. Attitude. A clerk is on the job. He or she is only in retail because they could not get a job doing what they really want to do or they are on their way to that next place. A salesperson has chosen retail as a career and treats it as such. They are glad to be at work, but the clerk wishes he or she was somewhere else. Attitude is infectious in retail. It can have a huge impact on your corporate culture. 4. Development. Since the salesperson is in a career, then he or she invests in themselves. They desire training and development. A Clerk disdains it. They "suffer" through it whereas a salesperson enjoys it. Since this is the case, though, it is very important for a retailer to spend the time and money to develop its salespeople. Otherwise, they will go someplace that will. Side Note: Millennial employees desire development, even the clerks. So this one has gotten harder for you. 5. Follow up. A salesperson follows up after the sale. They "lock in the sale" when the customer is in the store, but then they send a handwritten thank you note or call to check on the customer's purchase after a few weeks. This will "tether" the customer to your store and make them a loyal purchaser. Clerks are glad to see the customer go, but a salesperson is glad to see the customer come back. Professional salespeople are ones you want to invest in. Pay them more. Reward them more. Train them more. And they will make your business thrive. It all starts in hiring the right person to begin with. Make sure you are recruiting salespeople. Hire people who fit your culture, not the ones who have worked in your store type for years. For example, if you are a fitness store, just because someone knows a lot about fitness doesn't mean they know how to sell it. I work with a lot of fitness retailers and have found through the years that the storeowners tend to hire personal trainers to work in their stores. While these people know a lot about the equipment and how to get the most benefit from it, they rarely know anything about selling. They can deliver a great "class" but never ask the customer to buy. In other words, they are clerks and not salespeople.